If for some reason you didn't already know - I have a bit of a THING for vintage floral prints, especially when they're printed on items designed by the wonderful and truly British, Cath Kidston. 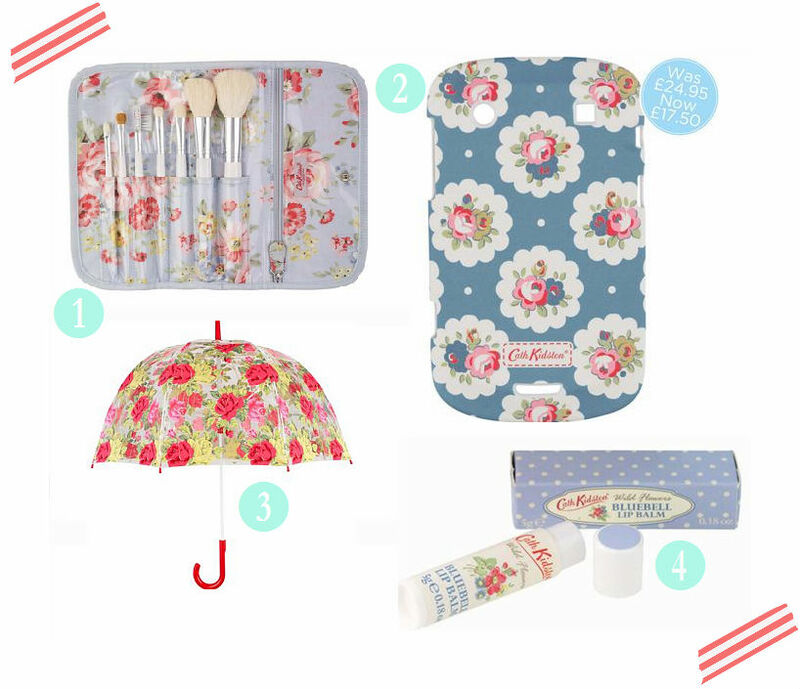 I haven't done a wish list post this week, so I thought I'd share with you a few of my most desired Cath Kidston accessories. I already have a beautiful floral box bag, bought from the store in St Pancras station, however I'm yet to get my hands on the beauties above. I have been looking to buy a makeup brush set for a while now. I love how this floral print set comes in a little case which also has a handly zip pocket to store things like hair grips - I always like to pin my hair back when applying my make up! The Blackberry phone cover is the cutest. There are a few designs to choose from (and some iPhone covers too) however the light blue floral pattern is my favourite, as it matches my gorgeous bag. I am fed up of the look of my boring Blackberry, so may have to purchase it to brighten it up a little! It has been reduced down to £17.50 making the cover even more tempting. After recently breaking my cheap Primark umbrella and getting soaked on the way home from university on numerous ocassions, I think it's about time I treated myself to this lovely birdcage shaped umbrella! I love the bright summery print, brilliant for brightening up the most miserable, rainy days. Has anyone tried the Bluebell Lip Balm? I hope it smells and tastes (not that I eat lip balm, but you know what I mean) as sweet as it looks! Do you own any Cath Kidston items? I LOVE Cath Kidston, then again, who doesn't? Also, bluebell lipbalm? I hope it smells as beautiful as real bluebells. I bought a bluebell candle recently and that was stunning. I really want to try the lip balm, it has good reviews on the website - lots of comments about it's lovely smell!